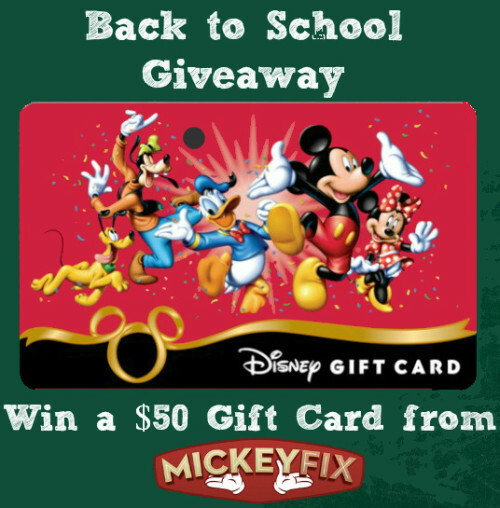 The Mickey Fix Back to School Giveaway: Win a $50 Disney Gift Card! Win a $50 Disney Gift Card for Back to School! Sharpen those pencils and rustle up that protractor: it’s Back to School Season! The Mickey Fix crew’s got our eyes on cool stuff like this Mickey JanSport Bag and these Star Wars On-Ear Headphones! We’re helping you get into the groove of Back to School shopping by giving away a $50 Disney Gift Card! Read on below for how to enter! We want to keep you in the know with all things Disney, so to enter to win a $50 Disney Gift Card, just subscribe to the Mickey Fix Newsletter! Once you’ve confirmed your Mickey Fix Newsletter subscription, leave a comment on this post (not on Facebook!) letting us know you did so and you’ll be entered to win a $50 Disney Gift Card! If you’re already a Mickey Fix Newsletter subscriber, just leave a comment below letting us know and you’re entered! Want an extra entry? Visit Mickey Fix on Facebook and then come back here on this post and leave a separate comment letting us know you did so! Want an extra extra entry? Follow Mickey Fix on Twitter and then come back here on this post and leave a separate comment letting us know you did so! The giveaway will end on August 7th, 2017 at 11:59 pm. The prize will be provided by Mickey Fix. We will confirm that you are a subscriber of the Mickey Fix newsletter. Mickey Fix is not affiliated with the Walt Disney Company or its subsidiaries. I follow on Twitter, too. Entered. Thank you for the chance to win. Liked on facebook. Thanks for the opportunity to win! Visited and liked Facebook!! Thanks! Went to Facebook also! Would love to win! Visited and Liked on Facebook! Supricribed to the newsletter and confirmed it! Checked out your Facebook page and already had liked it to follow! Checked out your Facebook page and already had liked it to follow your post! Visited it on Facebook as well! I’m already a subscriber of the newsletter. I visited Mickey Fix on FB which is how I found out about this contest. I’m a longtime subscriber to MickeyFix.com. I also follow MickeyFix on Facebook. And I just started following MickeyFix on Twitter! I almost already a newsletter subscriber!! ✨???? I already follow Mickey Fix on Facebook! Love your posts! I already subscribe…love life be looking ve Mickeyfix!! I’ve visited and follow on Facebook ???? I’m a subscriber to the newsletter! I visited the Facebook page and “like” it! Also follow on twitter, thank you for the chance! I visited on Facebook! Thank you! Subscribed. Thanks for the chance to win. Visited on Facebook as well! New comer to the newsletter! Excited for this drawing and to see what else the site has to offer! Already subscribed! Would love to win this GC for our September WDW trip? Visited through FB! Thanks for the opportunity! Already subscribe to MickeyFix newsletter. Jumped over to MickeyFix facebook which was where actually started to see the giftcard giveaway. Just signed up for newsletter!! Just followed MickeyFix on Twitter!! I Like McikeyFix on Facebook! I follow MickeyFix on Twitter too!!!!! I subscribe to your newsletter & follow you on all social media. We really need this you have no idea. Pleeeeaase! Already am a subscriber! And also visited Facebook too!! Alreadt subscribed would love to win for my special needs grandchild. I follow on Facebook! Thank you! I visited Mickey Fix on Facebook! I would love to win this to buy things for my Disney inspired classroom!! I’m a subscriber and follow you on Facebook. Enter me, please! I am a long time subscriber! Completed all the entry challenges! I just signed up for your fabulous newsletter!!! I look forward to reading it!!! Thank you! And I commented on your Facebook page!!!! Visited Mickey Fix on Facebook! Woot subscription done ! Fb like done ! I “liked” and followed Mickey Fix on Facebook. Can’t ever have too much Disney in life. Gotta have this!!! Me a Mickey fix!! Subscribed to Mickey Fix newsletter! Liked and now following Mickey Fix on FB! Just subscribed, looking forward to reading my emails ???? All signed up, thank you! Subscribed! Can’t wait for our trip in Feb! And I’ve now liked and started following Mickey Fix on Facebook. Thanks! Already following you on Facebook. Thanks! Signed up for need letter. Done! Thank you for the opportunity. Visited and “liked” you on Facebook. Liked and following you on Facebook. Just subscribed to your news letter! And already followed you on Facebook! So excited! I subscribed to the Mickey News letter! Already subscribed, visited Facebook, and already follow on twitter! I visited the Facebook page (and liked it) too! Following Mickey Fix on Twitter!! And I “liked” your FB page! I LOVE disney gift cards!!!!!! Just subscribed to the newsletter! Liked your page on Facebook! I subscribed to the Mickey Fix Newsletter. Hi ya Pal, hope I win! Thanks Mickey Fix!! I visited the Facebook page and even “liked” it. ???? Visited and followed on twitter! Visited and liked facebook page! Visited and liked on fb! Subscribed. Would love to win this. Visited on Facebook and liked! Love this newsletter! Always filled with wonderful things! I’m already subscribed to your newsletter! Now following on twitter too! Subscribed, liked and following. Gift card would be great! I visited liked and visited your Facebook page too! I visited the Facebook page too! How is it back to school time already!?! I subscribed hope I win the gift it will go towards our Disney fund! I visited you on Facebook. Popped in & said Hi ~ on Mickey Fix, on FB! I subscribe to Mickey Fix newsletter. I visited Mickey Fix on Facebook and I’m crushing on that necklace too. Signed up to be entered! Hi! Subscribed to news letter! Got a trip coming up in Nov. during F&W, so fingers crossed! I love receiving your email newsletter! ❤️???? And I “like” you on Facebook! ???? And I follow you on Twitter! ???? I love getting the Mickey fix emails! A happy subscriber!! Hope I win! Would be cool to win as we are flying the kids over in september! I do subscribe and love the newsletter it helps me to get started on my Christmas list. I do follow Mickey Fix on Facebook they find the best Disney items! I “like” Mickey Fix on Facebook! I’m subscribed to the newsletter! I get the newsletter, follow on FB and also on twitter! I am subscribed and follow on Facebook. Already subscribed! Thanks for the chance! Liked on Facebook. Thanks for the chance! followed on fb and already subscribed. Already a subscriber and can’t wait to shop! ???? Already subscribed and liked on Facebook! I subscribe and would love to win.